As Indiana State University student Farzana Shaheen introduced herself to an audience of Terre Haute residents, she told basic facts about her native country that were newfound details to people of a culture halfway around the world. Though Shaheen is a college student, her role as teacher is one of the primary reasons why she is at ISU. Shaheen is attending Indiana State this semester as part of the Global Undergraduate Exchange (Global UGRAD-Pakistan) Program, which is a program of the Bureau of Educational and Cultural Affairs of the U.S. Department of State. 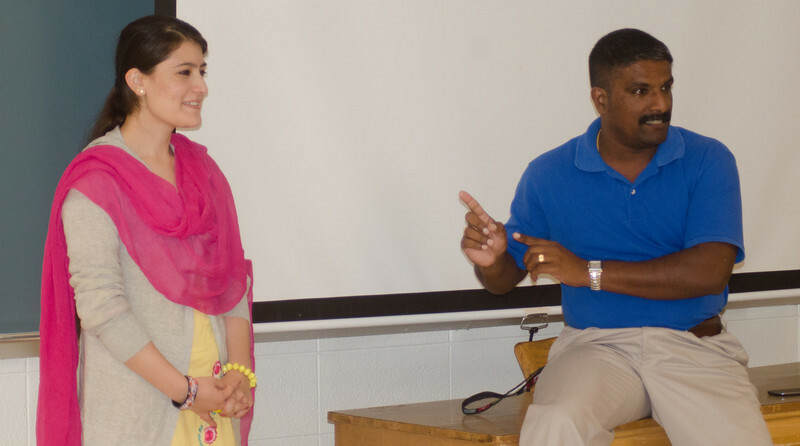 In addition to taking classes at ISU, the computer engineering technology major also acts as cultural ambassador of Pakistan, teaching people in the United States about the Pakistani people and culture. She also is learning about Americans and the country's culture so that she can inform people in Pakistan about life in the U.S.
"The UGRAD program is famous in Pakistan for undergraduate students because this program continues to exchange students between developing countries and the U.S.," said Shaheen, who added that the goal of the program is "to initiate the communication between people of Pakistan and people of the U.S., just to remove the stereotypes about people" from each country. Students in the program also perform community service and interact with Americans not only on campus, but in the community. Before starting classes at ISU, Shaheen met a host family in Terre Haute, who introduced her to other area residents and some common American traditions. "It was a great experience, because they were the first people who accepted me coming to the U.S., and they were so friendly to me," said Shaheen, who is also a software engineer student at the Islamabad campus of Shaheed Zulfikar Ali Bhutto Institute of Science and Technology. "They treated me like I was part of their family, so I am in contact with them. They call me for dinners and for different celebrations. They are part of my family now." Indiana State applied to be a host institution in the program. The university had several different requirements to meet to host a U-GRAD Pakistan student, said Zachariah Mathew, associate director of the ISU Office of International Programs and Services. The office worked with the College of Technology, which includes the computer engineering technology program Shaheen is studying. "Different departments on campus have different roles to play," Mathew said, "and we all come together." 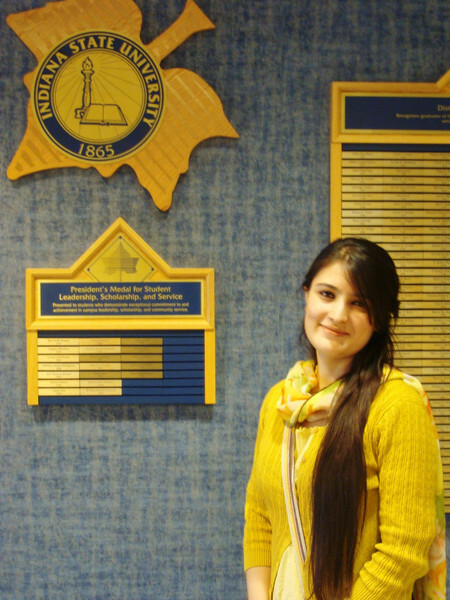 Once at Indiana State, Shaheen learned that life in the United States is different than some of the stereotypes she had learned while living in Pakistan. She had heard, for example, that Americans are unfriendly and that they do not talk much. Instead, she was impressed by the hospitality people extended. She met many people who are "accepting of people of other cultures without any hesitation." "My mind was totally changed" from stereotypes, Shaheen said. "Things that were seen in just one angle are totally different because we don't look for all the background," she added, comparing her experience as seeing a whole photo, rather than just looking at merely small part of it. Yet she also learned about some of the stereotypes that some Americans have of Pakistan. On multiple occasions, when she told people she is from Pakistan, she received many questions about terrorism. She has even heard assumptions form some Americans who think that people in Pakistan do not have basic technological items such as cars. People were also surprised to learn that not all Muslim women dress in clothing that covers them from head to toe, Shaheen said. Some Americans are also surprised to learn that, in Pakistan, women work in every career field. "It's totally different, because Pakistan is a liberal country," Shaheen said. "People of the U.S. and people of Pakistan, we are the same." While she interacts with Indiana State students on daily basis, she also has given presentations to different groups. She recently gave several presentations to Terre Haute residents who were part of the Osher Lifelong Learning Institute at ISU. Her first presentation was an overview about Pakistan, and for the second class meeting, she had a discussion and answered questions posed to her by members of the class. "The basic goal of mine to coming to the U.S. was to bridge the people of the U.S. and Pakistan because we have many stereotypes about each other," Shaheen said. "I just want to learn the culture of the U.S. and what the reality is behind these things." The College of Technology was interested in hosting a student from the International Research and Exchanges (IREX), which administers the UGRAD-Pakistan program, to provide American students with some international perspective, said Robert English, associate dean of the College of Technology. He has worked with the Office of International Programs and Services on having the college serve as a host for the program, particularly for American students who do not have experience studying abroad. "This is one of those win-win situations," English said. "It's such a positive thing because through IREX, you get some of the best international students, and it helps our classes, because we need more international students. "The whole intention is to make our students more globally minded, for them to better understand the wonderful opportunities out there, and to look at life with a much wider angle of lens," he added. Shaheen has been involved with a variety of different organizations. She has worked with several groups that promote and encourage girls and women to establish career goals and attain an education. She also is a member of the Pakistan Girls Guide Association, which is dedicated to empowering girls and women "working as the agents of change to build a better world," according to the group's mission on its website. Shaheen hopes to work on international efforts promoting equality for women. She wants to empower women throughout the world, as there are many people around the world who are suffering, she said. As part of her studies at Indiana State, she also wants to cultivate relationships with the hopes that more Pakistani students will be able to study abroad, including at Indiana State, as they could then learn about life in the United States. Photo: http://isuphoto.smugmug.com/photos/i-hvnfSLK/0/L/i-hvnfSLK-L.jpg (Submitted photo)Indiana State University student Farzana Shaheen. She is studying at ISU this semester as part of Global Undergraduate Exchange (Global UGRAD-Pakistan) Program, which is a program of the Bureau of Educational and Cultural Affairs of the U.S. Department of State. In the program, she acts as cultural ambassador of Pakistan, teaching people in the United States about the Pakistani people and culture. Photo: http://isuphoto.smugmug.com/Events/International-Student/i-3fBpMht/0/L/DSC_1390-L.jpg (ISU/Jamil Buchanan)Indiana State University student Farzana Shaheen and Zachariah Mathew, associate director of ISU Office of International Programs and Services, talk with a class from the Osher Lifelong Learning Institute (OLLI). Shaheen has given presentations and discussions about Pakistan as part of her studies at Indiana State through the Global Undergraduate Exchange (Global UGRAD-Pakistan) Program. Farzana Shaheen is attending Indiana State this semester as part of the Global Undergraduate Exchange (Global UGRAD-Pakistan) Program. In addition to taking classes, she also serves as a cultural ambassador of Pakistan to the U.S.